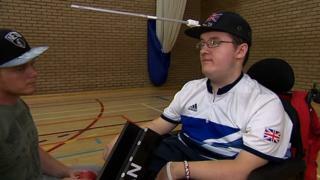 Boccia player Scott McCowan knows that the sport has made a massive difference to his life. The 23-year-old from Ayrshire has the muscle-wasting condition Duchenne Muscular Dystrophy and has been a wheelchair-user since he was nine. But having made his Paralympic debut in London in 2012, he has gone on to win European bronze and World silver in the BC3 pairs competition.